On May 18, 1944, a massive B-17 rumbled through the air over Romania. With a wingspan of 104 feet, weighing 20 tons, 13 machine guns at the ready, it carried a bomb load of 5,000 pounds. Earlier on the 3 1/2-hour flight to the target, Staff Sgt. John "Jack" Coogan had lowered himself into the ball turret in the warplane known as the Jaunty Joan. The 27-year-old Kearny, N.J. native was in a cramped, spherical cocoon, surrounded merely by Plexiglas and a little aluminum, with a view of the great abyss and maybe the ground 22,000 feet below. His only companions in the turret were two .50-caliber machine guns. After flying 25 missions, he knew full well that the ball turret could easily become a death trap. There wasn't room for his parachute. Even at 22,000 feet, the Jaunty Joan was being shaken to the core as deadly flak exploded all around. Suspended in his bubble, as explosives and hot metal came up to greet the B-17, Jack Coogan had a bird's-eye view of danger in the extreme. As was the custom with American bombers, the Jaunty Joan would attack in broad daylight. Dead ahead lie the target: the refineries of Ploesti, Romania, the main source of fuel for Germany in World War II and, arguably, the most heavily defended site outside of Deutschland. Sustained attacks on Ploesti could not begin until the spring of 1944 after bases in Italy were secured from the Germans. The Jaunty Joan's crew was part of the 772nd Squadron, 463rd Bombardment Group, known as the "Swoose Group," in the 5th Wing of the U.S. 15th Air Force serving in the Mediterranean Theater of Operation out of Foggia, Italy. Despite Supreme Allied Commander General Dwight D. Eisenhower's declaration that transportation and Luftwaffe targets were most important in the weeks leading up to D-Day, Lt. General Carl A. Spaatz, commander of the Strategic Air Force in Europe, believed oil production should be hit immediately. The first official 15th Air Force mission to strike against oil production -- there had been a few smaller raids targeting Ploesti rail lines -- was this one in which 700 bombers would take off from Italy intending to strike a knockout blow on Ploesti. The B-17 Jaunty Joan, with Coogan in the ball turret, was smack in the middle of it. If the flak wasn't enough, the 463rd faced another worry on this mission: no fighter cover from its own air force. To make matters worse, hundreds of other bombers had received a recall signal to turn back due to bad weather. For some reason the 463rd did not receive the signal. Down from 700 planes, now the 35 B-17s of the 463rd, combined with an estimated 170 other bombers, were the only fliers left to try to knockout the refineries. Over the target, the weather was now fair, the visibility hazy. With tremendous flashes and black bursts of flak filling the sky over Ploesti, bombardier Warren Myer took over the control of the Jaunty Joan from pilot John Nosal. At 1130 hours Myer yelled, "Bombs away." The Jaunty Joan and the rest of the 463rd were able to drop their bombs successfully on the heavily defended Romano- Americano Oil Refinery, originally built by Standard Oil of New Jersey. Jack Coogan was hitting a refinery constructed by a company right next door to his hometown. Nosal took control again and the Jaunty Joan turned for home. As flak continued to explode all around, the ship regrouped in formation with the other crews of the 463rd. They were far from in the clear. Just minutes after bombs away, the American bombers were attacked by unthinkable numbers of German aircraft. Accounts have it as high as 100 to 150 of the Luftwaffe's Yellow Nose fighters. The Jaunty Joan was flying Left Wing in the lead element of Able Formation when it was set upon by fighters. The battle was brutal. The ship's 13 Browning machine guns blasted away. Spent shells littered the floor and, undoubtedly, the odor of combat permeated the airplane—sweat, gunpowder, hot metal, and fear. The Jaunty Joan was hit severely. 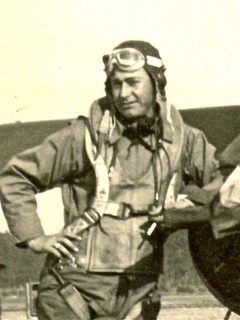 Tail gunner George Werdel was killed instantly when .30-caliber bullets ripped open his chest. Pilot John Nosal and co-pilot Weldon Harris feathered at least one engine. The Jaunty Joan fell out of formation to a lower altitude. Like sharks in a feeding frenzy, enemy fighters swirled around the wounded bomber. Nosal gave the order to bail out. He later reported that bombardier Myer escaped through the nose hatch, as did navigator Howard Anderson. Engineer-top gunner James Mann bailed out through the bomb bay. Waist gunner Raymond Wescott escaped through the waist door. Pilots Nosal and Harris jumped through the nose hatch. Radio operator Howard Roark kicked the ball turret to assist Coogan and motioned for him to get out. Roark saw Coogan bail out of the waist door and at that moment—a catastrophic blast. "Blown from plane by explosion," he later wrote matter-of-factly in a report. Roark was the last man out, leaving behind the already dead tail gunner, Werdel. There were three fatalities. Werdel was found in the wreckage. Co- pilot Harris landed in a lake and drowned before he could free himself from his harness and the lines of his parachute. Jack Coogan's death was a mystery. Roark reported that Coogan successfully bailed out of the waist door, but he was found dead on the ground, discovered by locals in Flamenda, Romania. His skull was crushed over his right eye, and his parachute had not opened. On the ground, surviving crewmen speculated whether it had been the explosion, the failed chute, or both, that killed him. Thirty miles southwest of Ploesti, the six crewmen of the Jaunty Joan who had parachuted to safety in Flamenda were able to identify the bodies of their fellow fliers. Coogan, Harris and Werdel were buried in the village cemetery by a Russian Orthodox priest. The six survivors were sent to a German POW camp in Bucharest. The summer of '44 was a grind for the men of the 463rd and the rest of the 15th Air Force. The idea of a single knockout blow against Ploesti had been a pipe dream. Twenty-four missions targeted Ploesti during the sustained campaign. All the while the 15th Air Force continued to bomb other strategic targets including Germany. The last mission against Ploesti was on Aug. 19, 1944. Days later, moving west, the Russian Army found nothing but rubble when it entered the 11 oil refineries. General Spaatz's oil objective, at least in Eastern Europe, had been achieved. In the book "The Fighting 463rd," author Harold Rubin described the end of the Ploesti campaign: "The cost had been 237 heavy bombers (later counts indicate 254) ... 15 Royal Air Force night bombers, 10 dive bombers, and 39 escorting fighters. More than 2,200 American airmen were lost in attacks on Ploesti. Of the bombers lost, 16 of them had belonged to our group ... In September of 1944, more than 2,000 airmen were returned to Celone Airfield from Romanian prison camps. When the backslapping, pounding and greetings were completed and the returnees had been given a good feed, we sat down to hear their stories." Staff Sgt. Howard Roark, of the lost Jaunty Joan, was one of those who spoke: "I never knew what hit us. The plane exploded into a million pieces. I must have been stunned and blown clear. The next thing I knew I was falling through space, fumbling for my ripcord. Don't think I wasn't worried when I looked down and saw that I had hooked my chest chute on backward. But it was too late to make a switch. I yanked real hard a few times and the chute spilled out. It wasn't 'til after I landed that I realized I had a bad flak wound in my back." For the mission on May 18, 1944, in which the Jaunty Joan was lost with five other planes, the 463rd received the Presidential Unit Citation. Why it didn't get a recall signal has never been fully explained or has been lost to history. Fourteen bombers were lost in the three wings that hit Ploesti that day, and the mission was the first against Ploesti that the 15th Air Force listed as "effective." The 463rd also notched an incredible number of downed fighters in the raid: 17 definites and 32 probables. Hitting Ploesti was a special kind of hell for the bomber boys of the 15th; it was so hazardous they received credit for two missions toward the goal of 50 to rotate home. Many, like Werdel, Harris and Coogan, never got close. After the war ended, the surviving crewmen of the Jaunty Joan paid a visit to Jack Coogan's widow, Kay Coogan, at her mother's home in Monsey, N.Y., where she spent the war. Apparently to put her mind at ease, they explained how Jack died from a piece of shrapnel as he bailed out of the plane and that he received a proper burial in Romania. Later, with Kay Coogan's permission, the U.S. government disinterred the remains and his body was reburied in the Ardennes American Cemetery in Neupre, Belgium. Over time, the sustained air campaign to destroy Ploesti faded in the consciousness of many Americans, perhaps overshadowed by an earlier controversial low-level, long-range mission that produced five Medal of Honor recipients. Or perhaps it was because of the heavily publicized successes of the "Mighty 8th" Air Force flying out of England. Nonetheless, knocking out the major source of Hitler's oil was one of the Allies' most important milestones. Empty German gas tanks at the Battle of the Bulge a few months later were testament to the success of the Ploesti campaign. The destruction of Ploesti can be considered the ultimate achievement of the 15th Air Force and the 463rd Bomb Group, a triumph that was one of the major factors in the Allies' inexorable path to victory in World War II. A postscript: Jack Coogan was my father's uncle. In the summer of 1944, the Western Union man turned sharply on his bike and pedaled down Kay Coogan's long driveway in Monsey. My father, Joe Spitzer, was there that day. Kay trembled; only recently married, 29 years old—and pregnant, she read the telegram about Jack's death and collapsed on the grass. The blue star in the front window was changed to gold. I am left to surmise that the crew, on returning to the States and visiting Kay, understandably sanitized the gruesome details of Jack's death. Until completing recent research, our family believed he was killed by the shrapnel hitting him in the temple. No thought was given to a crushed skull and certainly not to the chilling notion of his chute not opening. Kay Coogan passed away a decade ago, and it's just as well, of course, that she never learned of this. As to the unborn child? John "Jackie" Coogan is a retired police officer still living in the Hudson Valley. When he was six, his mom remarried and made a life with Jackie's stepdad. Jackie Coogan grew up to become a military man himself. As his father had done before him, he served his country with honor, this time in Vietnam. In a small corner of Kearny, N.J., Staff Sgt. Jack Coogan's place of birth, sits a park. In 1998, the American Legion and the city of Kearny dedicated the park in Jack Coogan's name. Today the children who laugh and play in the Coogan Memorial Playground have little idea of the fight for freedom that took place in the skies over Romania in 1944. This is, perhaps, as it should be, and is precisely the point of the struggle, the heroism and the sacrifice. Bruce E. Spitzer, who is editor of Massachusetts Banker Magazine, is a native of Piscataway, N.J. and a graduate of Rutgers University. © 2007 NJ.com All Rights Reserved.